Tonight’s big accomplishment takes me a long ways towards actually working on projects. 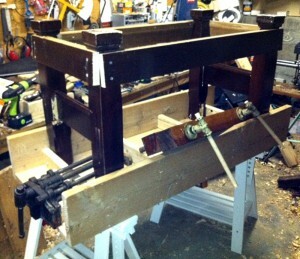 My “Frankenbench” now has some sturdy legs attached. These are the legs from a bed frame I am salvaging after it got messed up during a friends move. I’d been hanging on to this thing for ages knowing I could do SOMETHING with all this. I figured out how I was going to do the legs as I went, and I was able to re-use the stretchers from the bed frame to create the bottom portion with pre-built shelf brackets (it used to hold the box spring, should hold my tools just fine). Although I wasn’t able to go with the old brackets, the slots were too high up on the leg to form a useful storage area, which is too bad because that would have been easier to break down. I’m not going to say this is pretty, no way, no how, but it’s a workbench so I don’t think it has too be pretty, just functional. And speaking of function, the next step is to start attaching the real reason to build a bench… The VISE hardware. Work holding is super important for working wood with hand tools, I have come to realize that. So, this bench has a old sturdy quick release vise in the end vise position, and a salvaged “book press” to serve as the Twin Screw face vise. I’m not sure I’ll be able to use the wood from the press, or just the two beefy screws. I think the top will be too deep to have the chunk of wood that came with the press to line up with the outside of the bench top, so I’ll probably have to put some Douglas Fir 2 x 8 which just might be better. After I attack the vises, the next step is to thicken up the top by gluing 2 x 4 or 1 x 6 under the top. This should help make it thicker, and help with the holdfasts. I’ll have to drill a bunch of holdfast holes as well, and that’s going to be fun spacing it out to miss the stretchers. This is what happens when I don’t start out with a fully realized plan I guess. But, then again, this way I’m learning a ton of stuff about what I’ll need for my next bench, and there will be a next bench. Then again, maybe I should just flip this over, and start work on the gifts sooner. Hrm. Maybe just one Vise? Just one? Please?